Forest and District Stamp Club:At a recent meeting Epping Forest District Stamp Club held a successful stamp auction. 444 lots were offered for sale, of which 185 lots sold for amounts varying from under one pound to £90.00. The sale realised £874.50, with £94.93 going to club funds. Epping Forest and District Stamp Cl;ub meets on the second Tuesday of every month at 7.45 p.m. in the Wesley Hall, behind the Methodist Church in Loughton High Road. Visitors and prospective members are always welcome. Further details from Mrs. M. Browning, telephone 0208 508 1244. COMMUNITY SPORTS AND LEISURE PROJECT: In June 2001 Epping Forest District Council and NACRO (the leading independent, National Crime Reduction Charity in England and Wales) joined forces to develop a focussed sport and leisure programme for young people aged 8-25 years old. Representatives of NACRO held a meeting with the Tennis Club committee on 9th February and as a consequence an agreement was made whereby use of the tennis courts would be given over to the project for use by the youth in the village. -To encourage young people and particularly girls, to participate in physical activity. -To promote healthy lifestyles for young people. -To introduce leadership and mentoring opportunities for the benefit of the community. To reduce vandalism, petty theft and anti-social behaviour and fear of crime. -To create and develop a greater sense of community and reduce social exclusion. This scheme will be run in conjunction with the Buxton Trust and be on a trial basis for fourteen weeks commencing in March. Activities may extend to the sports field. So far 548 young people have engaged in regular physical activity over the last three years and in all participating areas in the district the figures for youth nuisance have significantly reduced. -Saturday morning coaching throughout the year for 5-16 year olds. Soft ball tennis in liaison with the primary school at the school in winter and the Tennis Club in summer. Parish Council Report: The report of the Parish Council Meeting for Thursday 29th January is now on site. Click Here. So far the responses have been pretty negative quoting Budgetary restraints and targeting communties that need Youth Centres most but not offering to review the descision or offering any explananation as to why there was not a democratic consultation process. Sue Thomas does offer ". . . to talk to the local community about how we can work together in the future" so perhaps we should make our views clear. a Thriller by Ira Levin. 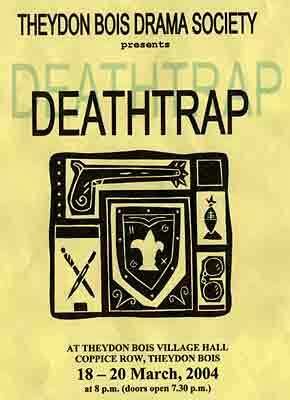 Deathtrap is an ingenious thriller set in the isolated home of playwright Sidney Bruhl. Sidney is struggling to write his next play but salvation appears in the form of Clifford anderson, a new up and coming writer. sidney plots to plagiarise Clifford's brilliant new script but will he be second-guessed by his famous neighbour, Dutch clairvoyant Helga ten Dorp? All the ingredients are there for a good old-fashioned murder mystery - or are they? The play runs from 18th - 20th March at the Village Hall. Tickets cost £6.00 and are available from Carol James. Telephone 01992 812250. EPPING FOREST LOCAL PLAN ALTERATIONS. We agreed it would be right to support a target of 70% new housing on previously developed land. We did not agree that the level of affordable and key worker housing to be sought on suitable sites to be the right amount. We suggested 20% to be fair. A similar response was given as to the percentage of affordable housing in rural areas. We did not agree that the proposals were the correct ones. Our responses indicated our community used the motor car for just about everything, pointing out that most used the motor car to shop at Superstores located well away from public transport. As for getting to work, most need to use the Underground. We gave a view that there should be continuing strict control of the Metropolitan Green Belt. We thought there to be a valuable contribution to controlled expansion within the Lea Valley. Growing salad produce in glasshouses reduces the need to import as much from Europe helping trade balances, reducing transport costs and pollution from the heavy vehicles. We expressed our concerns over government plans to expand Stansted and land along the M 11 corridor. We suggested the government help relieve the problem of overcrowding by building new towns towards the North of England. Anyone wishing to see the full response should contact Madeleine Murphy, Parish Clerk, to do so. Many incidents of wrong doing go unreported as many in our community believe that the police are unhelpful and will do nothing about a situation when contacted. requested any member of our community to, in future, inform the parish clerk of any contact they may have with the police over any incident in which they felt they were at risk. In this way the information can be collated and discussed with the police at the Police Liaison sessions. To help us help you, please follow these simple steps when telephoning the police. 1. Report the incident and ask for a Crime Report Number. 2. Obtain the officers name or number. 3. Time and date when you made contact. 4. Inform the parish clerk. Most important point is to obtain a Crime Report Number as each Report affects the local police statistics for recorded crime. At a recent meeting on crime and personal safety a police officer informed us that more police on the streets was proven not to work and that we should always telephone. PARISH CLERK, Madeleine Murphy. 01992 81 3442. The police consider Theydon Bois to be a safe place to live and relatively free from crime. Let's work together to prove them right. Urgent News on Youth Centre: At the Parish Council Public Meeting last Thursday council members continued to voice there opposition to the closure of the Youth Centre off of Loughton Lane (see below) and said they would be opposing the outline planning application from Essex County Council for the site. Theydon Bois & District Rural Preservation Society said that they would also be writing to oppose the application. Members of the public present felt that weight of numbers in opposition would still help if we are to stand any chance of getting this application rejected and retaining the Youth Centre. All village residents are requested to write to Epping Forest District Council opposing this application from Essex County Council. Comments regarding the application must arrive by 6th February, must be in writing and addressed to The Head of Planning, EFDC, Epping Civic Offices, High Street, Epping, Essex, CM16 4BZ. Given the short time available to respond the Preservation Society have made available a model letter which you can download from this page, alter if you wish, add your name, address then sign and send in. We would encourage as many of you as possible to do this. To download the letter which is in Word format and has been virus checked Click Here. Theydon Bois Open Gardens Day: This years Open Gardens Day will take place on Sunday 27th June 2004. 11am--6pm. Tickets for the gardens from the Village Hall Adults £3.00 OAP's £2.50 Children free No Dogs. 15 gardens open to the public. Lunches and teas in the Village Hall. Parking on the Green. Free Minibus to the farthest gardens. More details of this years event soon. Check out last years event and photos Here. Music Evening: The Baptist Church has a music evening on Wednesday 11th February with a Youth Choir from Randers, Demark, which is free and starts at 8pm. They also invite you to eat with them before the performance at 6.30pm but if you wish to do so please contact Jenny Dowe on 01992 812566 by 8th February. Donations towards the cost of the meal will be welcome on the night. Womens Institute News: Peggy Cooke, our President for the last three very successful years, retired in November 2003. During her term of office, members participated in many events, strawberry teas, pancake days, bridge days, coffee and cake mornings, sherry mornings and many more. There were outings to places of interest and trips to Westcliffe to see the Southend Operatic and Dramatic Society in their latest production. Most recently, Theydon Bois WI went to the Festival Hall to hear the John Rutter Christmas Concert. The handicraft section became more of a social morning as more and more members came along, but were not craft minded to the same extent as in previous years. Our work to support local charities was very productive and this year the local charity Playground at Theydon received over £600 towards the purchase of play equipment. Members expressed opinions on issues that they considered merited representations to make to government. Now to a new year! Our President for this coming year is Mrs Doreen Snell, known to many through her work as secretary three years ago. The programme secretary, Mrs Jackie Robertson, has arranged the many items of interest for the year 2004 check them out on the Club Details Page. Since the mid 1990s, a strong link has existed between Theydon Bois and the Copped Hall Trust. This is partly due to the efforts of Charles Rush, now sadly deceased, who was the first Chairman of the Friends of the Trust, and also a number of villagers who helped him with the initial restoration of the Hall and grounds. The Parish Council and the Village Association have also helped considerably, not least in making available the village hall for the popular Copped Hall lectures; other activities of the Trust and Friends have been well supported by the village. The following is a resume of current Copped Hall activities. Work has commenced on the restoration of the Victorian extension, which was constructed in 1895 to enlarge the Mansion and accommodate the domestic services. Vegetation resulting from nearly a century of neglect has been removed and the area containing the lift is being stabilised. The lift itself will be restored, eventually, and is of particular historic significance being one of the first to be installed in an English country house. The first lecture was given by Jeff Page of the National Gallery who talked about Artists in Essex which, surprisingly, included William Hogarth, Joseph Turner, John Constable and Alfred Munnings who all painted Essex scenes. The second was a most interesting account, given by David Thorpe, of the recent archaeological excavations carried out to establish the foundations of the Tudor and medieval mansions. On 8 Feb 04, Paul Atterbury of the Antiques Road Show will be talking about the Golden Age of Travel, and on 21 Mar 04 Allan Cox, the Trusts Architect, will give a resume of the restoration work at the Hall during the past year; both lectures will be given in the Theydon Bois village hall. Following the great success of a Midsummers Nights Dream staged at the Hall in the summer of 2001, plans are in hand for a further Shakespearean production for 2004, this time possibly in conjunction with a local drama company and again in the grounds. Repeating the musical successes of 2003, it is planned to hold further musical events in the Mansion during 2004. Because of the few facilities currently available within the Mansion, the seating there will be restricted; regretfully therefore, ticket sales for certain events will be limited to members of the Trust and the Friends of the Copped Hall Trust. However, why not join the Friends whose membership continues to increase? Those interested should contact either myself on 01992 813002 or the Membership Secretary, Bob Perdeaux, on 0208 989 0599. You will be assured of a warm welcome, receive a newsletter and have the opportunity to help with the exciting task of restoring Copped Hall. There have been a number of queries made to this Web Site regarding when Broadband via B.T. ADSL will be available in our village, it is already available via cable with NTL for those wanting to take that option. The trigger level for our B.T. Exchange had been set at 250 people registering an interest and this target was met on the 12th January this year. B.T. are now indicating that the exchange is "Ready for Service" but still not giving an indication of when the exchange will be upgraded. Lets hope it's soon. More information is available on the ADSL Guide Site for Theydon Bois. Parish Council Meeting: The first Public Meeting of the Parish Council for 2004 is on Thursday 29th January in the Village Hall. We hope to be able to have a demonstration of the latest developements to this Web site and information on the New Look Village News. Please come along and have your say. A full list of Parish Council Meeting Dates for 2004 open to the public are now on line. Click Here. Youth Centre Loughton Lane: In a recent statement, the Essex County Council (ECC) announced that the village Youth Centre in Loughton Lane was surplus to requirements and would close in July 2004. The site would be sold for development for an expected sum of £1.1 m. A new Youth Centre was being built in Loughton but would not be available until after the closing date. John Eaton, Chairman of the Theydon Bois Parish Council (TBPC), criticised the ECC for their action saying that the building was only 11 years old and ideal for getting youngsters off the street. The ECC should have worked with the TBPC to encourage its greater use. Another building on the site, the Scout Hut, had also been declared surplus but the Scout Leader, Bob Penman, had received assurances the its lease was secure and that the building was not in danger. Nevertheless, the TBPC thought that the Hut might be included in the sale and would therefore be searching for any restrictive covenants on the site. The latest news as at the 12th January 2004 is that Epping County Council is applying to Epping Forest District Council for an Outline application for residential developement on the site. The plans and documents for this are available at the Civic Offices in Epping from Monday - Friday, 9.00am - 4.45pm. Clearly if this Outline Application is granted it will make the site much more desirable (and valuable) to developers. Anyone who wishes to comment on the application has until 6th February to do so, this must be in writing and addressed to Alexander Sebbinger, Civic Offices, High Street, Epping, Essex, CM16 4BZ. Keeping Fit in the New Year: If your a youngster who has over indulged this Christmas why not resolve to get fitter this year. Andy Major runs a Karate Club that meets on Tuesdays in the Village Hall that will certainly make you fitter in both mind and body. Andy teaches Te Ashi Do Karate, Wado-Ryu style with classes for 'Dinky Dudes' from 4pm - 5pm and Juniors from 5pm - 6pm, he also runs Adult clases in Loughton & Epping. For details of the club contact Andy on 07941-164544 or visit his Web Site. St Mary's Church Hall, 11.00 to 12.00 am. Helpers needed for sorting from 9.00 am onwards. For jumble collection please contact Julie Bedwell on 01992 812993. Village News: The PDF of the December issue of the Village News is now available to download. This issue contains many interesting articles about happenings in the village and many colour photos. Click Here. Parish Elections: The Parish Elections will take place on 10th June, 2004. If you feel that you can make an effective contribution to the Council please contact the local office of the political party to whom you wish to align, or contact any existing parish councillor who will be happy to advise you. Stansted/M11 Corridor Study: The integrity and quality of life in our village has never been more under threat than from the present proposed developments surrounding Stansted Airport & the M11 Motorway. The Parish Council and Theydon Bois and District Rural Preservation Society have very busy responding and objecting to a lot of these proposals and below we publish an article by Peter Newton, Chairman of the Society. As Peter points out it is important that if we want to defend the rural nature of our village it is important that we are all ready to object to unacceptable development Weight of numbers still counts in these matters. You can also if you wish download both the Parish Council's & Theydon Bois and District Rural Preservation Society's full response letters to the Stansted\M11 Study. (Note these letters are in Word and have been Virus Scanned so are safe to download). 4) The Stansted/M11 Corridor Development Options Study. In each case we have expressed, on behalf of the membership, our alarm at the possible despoliation of our rural setting; endeavoring to cite and object to those aspects that seem ill considered, or not considered at all, more particularly the lack of resources of water, health provision, transport infrastructure and the likely ending of oil resources by 2040 - as attested to by the UK Petroleum Industry Association. We have stressed the need for preserving the Green Belt, especially between Epping Forest and the open country to the east, both north and south of Theydon Bois. The East of England Regional Assembly (EERA) is currently drafting a Regional Spatial Strategy for the East of England (draft RSS14) that will include a sub-regional strategy for the London to Cambridge Corridor, which includes the Harlow and Lee Valley areas - and of course Theydon Bois - presumably taking into account all the above studies. By Spring 2004 the draft RSS14 is due to be submitted for 'public consultation', followed by a public inquiry into EERA's proposals. If experience is anything to go by, the time permitted for 'consultation' will be very short but the Society hopes to organise at that time a letter writing 'blitz' by our membership - so we urge everyone to keep an eye on the Society's page on the Village web site and to look out for any other publicity we organise. Suffolk, Norfolk, Cambridgeshire, and Bedfordshire. It is unelected, but the Leader of Epping Forest District Council is one of its fifty members. At a Special Meeting the members of the Forest Philatelic Society recently voted to change the name of their club to Epping Forest and District Stamp Club. The Club, which is over 60 years old, meets on the second Tuesday in every month throughout the year at 7.45 p.m. in the Wesley Hall behind the Methodist Church in Loughton High Road. The monthly programme includes displays from visiting clubs and collectors, auctions, competitions and bourses. Members of the club have the opportunity not only to increase their knowledge of stamps but also to acquire material for their collections at very reasonable prices. Visitors and prospective members are always welcome at meetings. For further information anyone interested in stamp collecting living in the Epping Forest area or the surrounding districts should contact the Hon. Sec. Mrs M Browning, telephone 0208 508 1244.